30 Apr Lookers launches female apprentice network as part of diversity efforts. Motor retailer Lookers has strengthened its position as a diversity employer of choice by launching its first ever Female Apprentice Network. 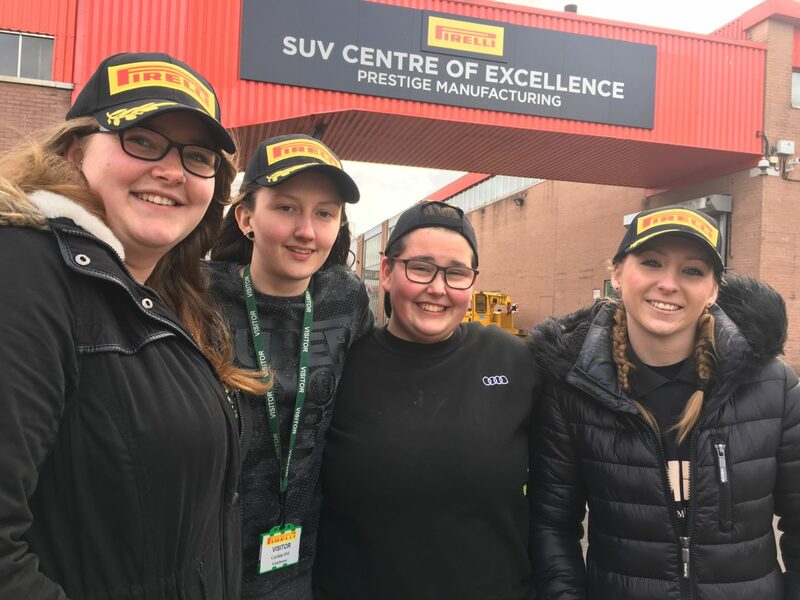 The network was launched at global tyre company and Lookers partner Pirelli by female apprentices from across the Lookers dealership network and will allow them to share experiences, ambitions and learning as they work to complete their training and begin a career in the motor industry. The launch of the network, which took place at the Pirelli factory in Carlisle, will involve regular opportunities for the apprentices to meet up as well as share their experiences on social media as a way of supporting their ongoing development. This follows the announcement by Lookers during last month’s National Apprenticeship Week that it is recruiting 160 new apprentices in 2018 and is working to double its intake of female technical apprentices. The launch venue was chosen as tyres and tyre changes are a vital part of the Lookers technical apprenticeship training programme and saw four members of the network treated to a tour of the facility by key members of the Pirelli team. Amongst the four ladies from across Ford, Audi, Volkswagen and Vauxhall was a volunteer sailing instructor, football player for South Shields Ladies, a horse owner and a gymnast. They will now be able to stay in touch, ask questions and seek advice through an accessible Female Apprentice Network social media forum, as well as through regular meet-ups. The Lookers Apprenticeship Programme has received a number of high profile award wins recently, including being recognised as one of the Top 100 Apprentice Employers in the country and triumphing in The Open University Sponsored Macro Employer category of the National Apprenticeship Awards held in January. To find out more and apply for an apprenticeship at Lookers, visit: Lookers.co.uk.